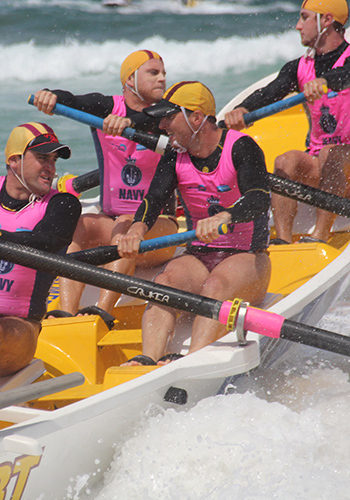 A boat crew shall consist of five competitors, four of whom shall be “rowers” and a “sweep” who controls the boat by use of a sweep oar and commands to the rowers. Boat crews start at the water’s edge holding their boats ready. On the starting signal, crews row around their assigned turning buoy situated approximately 400 metres off shore and return to the beach. The winner is the first crew to pass their boat between the finish flags on the beach. If you require any more information please contact our surf boat captain.